John "Hondo" Havlicek was a standout NBA player during the 1960s and 1970s and is remembered as one of the top players of all-time. Part of the Boston Celtics' dynasty during the earlier years of the NBA, Havlicek remains a popular collecting option. Shop for John Havlicek Cards on eBay. After winning an NCAA title at Ohio State in 1960 playing alongside Jerry Lucas, John Havlicek joined the NBA in 1962 as the seventh overall pick by the Boston Celtics. He was also selected in the 1962 NFL Draft by the Cleveland Browns, but decided to focus solely on basketball. John Havlicek spent his entire career with the Celtics, totaling eight NBA championships and 13 All-Star selections and setting many team records. 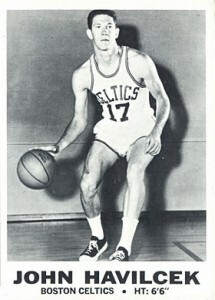 The all-time leader in points for the Boston Celtics, Havlicek's number 17 was retired by the team and he was later added to the Basketball Hall of Fame. 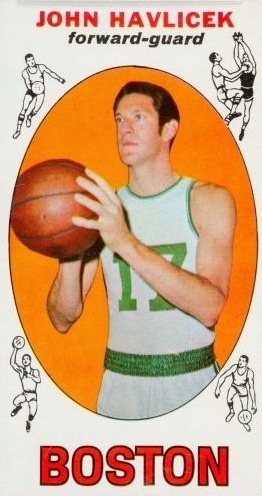 Although John Havlicek played 16 seasons in the NBA, his card options are limited, especially from the beginning of his career. His first cards were not produced until 1969 and the earliest cards were very limited. Beginning in 1969-70 Topps, Havlicek was consistently featured in basketball card releases until his retirement following the 1977-78 season. John Havlicek does not have a ton of signed cards, but he has signed for several modern products from Panini and Upper Deck. The earliest autographed cads for Havlicek can be found in 1999 Upper Deck Century Legends and the first relic card came in 2001-02 Upper Deck and Upper Deck Legends. Part of a unreleased test set from Topps, apparently as they pursued the NBA license, this is the earliest John Havlicek card and considered by many as his true rookie card. The 22-card set features a simple black-and-white design and the card backs could be lined up to form an image of Wilt Chamberlain. Collectors will notice that the the card actually misspells Havlicek's last name. These rare cards rarely surface and are tough to find in high grade when they do. More oddball than true card set and quite rare, the actual release date for 1969 NBAP Members is not certain, but the general consensus is that it started releasing around 1969 or 1970 and was possibly issued over several years. 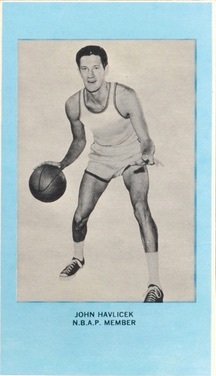 The early John Havlicek card is part of a 20-card set and the cards themselves vary in size by the player. Featuring a very generic look, especially given the airbrushed jerseys, the cards are little more than a light blue border and black-and-white photo with a small text area for the name. It is believed that the cards may have been made from basketball shoe boxes. 1969-70 Topps is the primary option for collectors when discussing early basketball cards for John Havlicek. The tall-boy design works well for basketball players and the colorful release has a strong following among vintage basketball collectors. Ungraded copies of his official rookie card can be had for as little as $10 while high grades push into the thousands. Also found in 1969-70 Topps, these cartoon inserts were found one per pack and stand roughly 2-1/2" by 9-7/8". The colorful Havlicek insert card notes his height using the ruler design. 1969 Topps Rulers #9 John Havlicek Rookie Auto RC PSA DNA HOF Boston Celtics! JOHN HAVLICEK 2007 Press Pass Authentics ON-CARD AUTO AUTOGRAPH SP ! RARE ! JOHN HAVLICEK 1999 UPPER DECK CENTURY LEGENDS AUTO AUTOGRAPH CELTICS CARD!